Linear equations are equations of degree one. Solving a linear equation is a process of undoing operations that have been applied to the variable to create the equation. Your goal is to isolate the variable on one side of the equal sign. Remember that the "equal sign" implies that the expressions on either side are equivalent. You can think of both expressions as "weighing" the same amount. You must be careful, when solving for the variable, to maintain an equal "weight" on both sides. 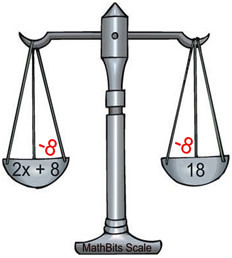 This process of "balancing the equation" is accomplished by always making the same changes to BOTH sides of the equal sign. Analysis: We need to isolate the variable x. Since the number 7 has been subtracted from x, we will need to do the opposite and add 7, to get rid of the -7. This process is actually using the additive inverse property to create a 0 on the left side (-7 + 7 = 0), and then using the additive identity to isolate the x, since x - 0 = x. Remember to add the 7 to BOTH sides of the equation, to keep the equation balanced. Since the number 6 has been added to x, we will need to do the opposite and subtract 6, to get rid of the 6. This process is actually using the additive inverse property to create a 0 on the left side (6 - 6 = 0), and then using the additive identity to isolate the x, since x + 0 = x. Remember to subtract 6 from BOTH sides of the equation, to keep the equation balanced. Since x has been divided by 4, we will need to do the opposite and multiply by 4, to get rid of the 4. This process is actually using the multiplicative inverse property to create a 1, and then using the multiplicative identity to isolate the x, since 1•x = x. This problem could also be solved by dividing both sides by 1/4 (which is the same as multiplying by 4). But, why make the problem more difficult! Remember to multiply BOTH sides of the equation by 4, to keep the equation balanced. Since the number 5 has been multiplied times x, we will need to do the opposite and divide by 5, to get rid of the 5. This problem can also be solved by multiplying both sides by 1/5 (which is the same as dividing by 5). Remember to divide BOTH sides of the equation by 5, to keep the equation balanced.